This, that, and the other thing – Odd thoughts. This is such a pleasant, pleasant book! 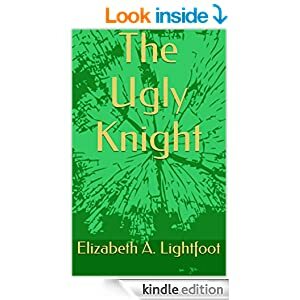 There is a lightness in the way it is written, that even in the scenes where Korton (The Ugly Knight) and Elzi (his resolute love interest) face the Ultimate Evil, it’s almost…peaceful. There is one exception, which I’ll get to later. I THINK that the reason the book is so pleasant has to do with the nature of Korton. He is an unassuming young man, the son and grandson of a tailor, so he doesn’t have snooty attitudes to get over before he becomes likable. He succeeds in his difficult apprenticeship process because he works hard. He gets up early. He takes care of his own horse. And while he does not have the raw, natural talent of Jelan, a senior squire who befriends him, he just keeps practicing and hammering away until, pretty much to everyone’s surprise, he finishes early and with greater skills than any of his peers. It’s true character, not just a role that he is playing. On his first quest, to kill a dragon, he takes the time to befriend an aged house servant. Because this is a book, of course, it MUST be shown that his easy-going relationships with servants produce unexpected rewards, but honestly folks: he’s not doing it for that reason. He’s just a nice guy. And he meets a nice girl, and good things happen: they become friends, and eventually fall in love. I’ve put “The Ugly Knight” on sale for the next few days at Amazon. Today it’s on sale for $1.99, tomorrow it’ll be $2.99, etc. If you like it, or even if you don’t, please leave a review. And yes, I know the cover could be improved, it’s too generic. According to Hoyt The ramblings of Sarah Hoyt (and friends). This includes political commentary, novel chapters, discussions of writing, and the writing industry, and much more. The Elfyverse My friend Barb Caffrey discusses writing, her books, sports, politics, book reviews, whatever else is on her mind. Mad Genius Club A group of indie writers discuss various aspects of self-publishing, from making covers, to editing. They discuss the perils and perks of self-publishing. And have great fun doing so. Be Swift, Be Precise My husband’s blog. ❤ He tries to blog every day. Frequently it’s on things he covers in the classes he takes, some thought on movies, books, life in general.